Follow WTOP's coverage of the trial as it happened. Good afternoon, the second week of the trial has now ended. (The court doesn't meet on Fridays). Below is a recap of some of the key events from Thursday, which included testimony from D.C. firefighters who discovered the bodies of the Savopoulos family and their housekeeper inside their burning house in May 2015. Against the objections of Daron Wint's public defenders, prosecutors displayed for the jury a graphic photo of the badly burned body of 10-year-old Philip Savopoulos. Find out why the judge allowed the use of the photo and what exactly it showed in the link above. Jurors Wednesday also heard from the lead D.C. police evidence technician who led the team responsible for documenting and collecting evidence taken from the Savopoulos home. Over the course of several hours Thursday afternoon, Jeffrey Henderson, with D.C. police, described items that were found at the house as prosecutors opened box after box of evidence recovered from the scene. Two baseball bats were taken from the home. A black baseball bat was found in the downstairs living room. A second baseball bat — a wooden Louisville slugger, bloodied on one end — was found in one of the upstairs bedrooms. Earlier during the trial, the grandfather of Philip Savopoulos told jurors he had had the baseball bat engraved with his grandson's name and given it to him as a gift. Pieces of duct tape were found in the driveway of the house. Prosecutors have said Savvas and Amy Savopoulos and the housekeeper, Vera Figueroa, were duct-taped to chairs upstairs to restrain them during the 18 hours they were held hostage. Photos showing duct-tape residue on the legs of the chairs were also shown. Henderson also discussed a knife found propping open a bathroom window in the basement of the house. It's unclear how the knife got there. A firefighter who testified earlier this week said he thought it was unlikely first responders would prop windows open with objects. Firefighters are actually trained to smash windows opened instead of wasting time with unlocking and opening them, a fire investigator testified. Also introduced as evidence Thursday were several blood-soaked items, including a comforter, bloodstained fabric taken from chairs in one of the upstairs bedrooms and a plastic bag covered in dried blood that was found underneath one of the overturned chairs in the bedroom. Photos from the crime scene shown to jurors depicted a large, deep-red bloodstain soaked into the hardwood floors of the upstairs bedroom and blood spatter on a nearby desk. Among the items Jeffrey Henderson, the D.C. police technician, unpacked from evidence storage and held up from the witness stand for jurors to review Thursday were the two Domino's pizza boxes found in one of the upstairs bedrooms. According to the time code from the sticker printed on one of the boxes, the pizza order was placed at 9:14 p.m. May 13 — during the time prosecutors say Daron Wint was holding the Savopoulos family and their housekeeper hostage. At the time, D.C. police didn't have a policy of keeping perishable items as evidence, Henderson testified. So the pizza itself was, presumably, not kept as evidence (A swab of the crust revealed a connection to Wint, prosecutors said). But the two pizza boxes were kept as evidence. There were two pizzas ordered. There appeared to be several slices eaten from one of the pizzas, according to crime scene photos. There also appeared to be part of a crust left behind. The other pizza was left untouched, according to the crime scene photos. Good morning. Court is not in session today but we'll be answering a few reader questions throughout the day. Stay tuned for more updates. HI Megan! What's new today? I would love to get your take on the mood of the room - impressions of Wint and how he appears to be acting / behaving / etc. Thanks! The testimony from the groundskeepers across the street seem to help the defense considerably. Now it seems Wint wasn’t even in the house until an hour before the fire. 1) Is Daron Wint scheduled to testify? 2) Have the brothers made any comments about being accused by defense of being the actual killers? What happened to the family's two Chesapeake Bay retrievers? Crime scene technicians combing a Northwest D.C. mansion in May 2015 after the bodies of four people were found inside collected boxes of evidence: A blood-soaked comforter, a bloodied baseball bat, a samurai sword. But attorneys for the man charged with killing three members of the Savopoulos family and their housekeeper are now pressing crime scene technicians about how some evidence taken from the house was handled and about why some pieces of potential evidence don't appear to have been collected at all. Daron Wint, 37, of Lanham, Maryland, is charged with first-degree murder in the deaths of Savvas Savopoulos; his wife, Amy; their 10-year-old son, Philip; and the family's housekeeper, Vera Figueroa. The third week of Wint's trial began Monday. The defense's questions about evidence handling center on the house's basement. Crime scene photos taken early on in the police investigation show multiple windows in the basement that appear to have been propped open with random objects. In one photo, a bathroom in the basement is shown propped open with what appears to be black-handled kitchen knife. There were apparently other windows in the basement propped open with items that were not collected. Under questioning from public defender Judy Pipe, Henderson said one window was held open with a red Frisbee that was not collected. Another crime scene photo shows a window being propped open with a square wooden block resembling a child's toy. The defense sought to raise questions about the handling of evidence even before the trial began. A pre-trial court filing indicates an ATF forensics expert named Emily Head recalled seeing a basement window being held open with a screwdriver. "Ms. Head recalls asking that the screwdriver be collected, however she does not believe it was recovered," the court filing stated. On the witness stand Monday, Henderson said he had "no clue" who Emily Head was and that he doesn't remember anyone asking his team to collect a screwdriver propping open a window or seeing it. It's unclear when the windows were propped open and whether they had anything to do with an intruder or intruders entering the house. Henderson testified that he doesn't think he would have propped up windows in the basement with random items. Earlier during the trial, a D.C. fire investigator testified that firefighters are trained to smash windows in order to ventilate rooms rather than wasting time with unlocking and opening them. Hours after three members of the Savopoulos family and their housekeepers were killed, a blue Porsche, which belonged to the family, was found set ablaze in a parking lot in Lanham, Maryland. The parking lot is near 85th Avenue where Daron Wint, the man charged with the killings, and several family members lived. Sgt. William Norris, a Prince George's County police officer, who investigated the Porsche fire, said police obtained surveillance video from the back of the nearby restaurant, La Fontaine Bleue. The video showed a male figure running from the area of the Porsche carrying what appeared to be a white bucket. The video was too grainy to clearly identify the figure. The car was found on fire at about 5:30 p.m. on May 14. Earlier that afternoon, a witness reported to police seeing the car being driven erratically by a black man with short, well-groomed hair wearing a green construction vest, according to previous police affidavits. However, Daron Wint has shoulder-length dreadlocks-style hair. Inside the Porsche, on the driver's-side floor, investigators found one of the green vests, Norris said. (Investigators later said they found Wint's DNA on that vest). Norris said he doesn't know what time the fire started but in his estimation, the car was on fire less than 15 minutes before firefighters arrived. A tow-truck driver testified Monday about an encounter he had with a man he picked up near where the Savopoulos' blue Porsche was found burning on May 14, 2015. Douglas Ventura, who owns a towing company, told jurors he was approached by a man on Annapolis Road in Lanham, Maryland, who asked for a ride into D.C. to pick up a minivan that had been parked on Pennsylvania Avenue in D.C. near George Washington University. The tow-truck driver said he doesn't remember the passenger's age only that he was a dark-skinned man. Speaking through a translater, the driver said even if he saw that passenger today, he couldn't ID him. The driver also said he didn't see any blood on the man's clothes or smell gasoline. Although the driver worked for AAA, there's no record of the towing, because it wasn't placed through the service, he told jurors. Still, a D.C. traffic camera picked up the driver's truck entering D.C. via New York Avenue and Montana Avenue at 2:25 p.m. on May 14 -- about an hour after firefighters received the first report of the Savopoulos house being on fire. The driver told jurors he towed the car back to the same area where he picked up the passenger. After three members of a D.C. family and their housekeeper were killed and the family’s mansion set on fire in May 2015, traffic cameras tracked the family’s stolen blue Porsche through D.C.
Find the full recap from day 8 in the courtroom in the article linked below. The recap includes how prosecutors used traffic cameras to track the Savopoulos family's stolen blue Porsche through D.C. and in to Maryland on the day three members of the family were found inside their burning mansion. Also, Daron Wint's stepmother testified about his whereabouts May 13-14, 2015 -- during the time the family and their housekeeper were help captive in their home and an ATF digital expert testified about reviewing thousands of pages of files from Daron Wint's Facebook page. Several hours after the fire at the Savopoulous family's Woodley Park mansion and the grisly discovery of the bodies inside, police found Amy Savopoulos' burning blue Porsche in the back of a church parking lot in Lanham, Maryland. Earlier this week, the jury heard from a Prince George's County police officer who said a nearby surveillance video picked up a figure running from the scene of the burning Porsche that May 2015 afternoon. The video was too grainy to make much out — although it appeared the figure was carrying what appeared to be a white bucket. (More about that video below). However, it turns out an eyewitness, who worked at a nearby restaurant, said she saw a man matching Wint's description near the parking lot that day — shortly before the car burst into flames. The employee of the nearby restaurant/caterer La Fontaine Bleue in Lanham, testified Wednesday. She told jurors she was leaving the restaurant for the day at about 5 p.m. May 14, 2015 when she saw the man. The man grabbed her attention because she saw him walking and turning back several times. She described his movements as "go and stop, go and stop." She described the person she saw as a black man with shoulder-length braid hairstyle, about 5 feet 10 inches tall with a muscular build. The catering employee described seeing a photo of Wint later. "Like a punch to the gut, I immediately knew that's what I saw in the parking lot," she said. One interesting thing to note: Regarding the surveillance video taken from the restaurant, the restaurant employee said she doesn't think the figure seen running was the same man with dreadlocks that she saw. Day 8 in the murder trial of Daron Wint, who's accused of killing three members of the Savopoulos family and their housekeeper in May 2015, featured key testimony from crime scene technicians and analysts who processed the Savopoulos family mansion for fingerprints and DNA. Todd Bille, the leader of the DNA unit at the Bureau of Alcohol, Tobacco and Firearms and Explosives, testified he took about 20 boxes of swabs from the house to the ATF lab for testing. Bille told jurors there were two sets of swabs taken from the crust of a Domino's pizza that had been delivered to the house during the time authorities have said the family was being held captive there. Bille testified the DNA swabs were a match to Daron Wint, whose DNA was already in a federal database. However, under questioning from public defender Judy Pipe, Bille also told the juror the presence of DNA doesn't tell investigators the circumstances of how Wint's DNA got on the pizza or when. The defense has sought to raise questions about how crime scene technicians handled evidence at the scene. On Wednesday, jurors heard from a crime scene tech who's own DNA wound up on items taken from the home. Steven Weitz, an ATF forensics lab supervisor, told jurors he processed pieces of potential evidence from the house and swabbed a burned construction vest for DNA. At some point, he became aware that his own DNA was found on a pair of scissors hung with other gardening-style equipment on a wall leading down to the house's basement. Weitz testified it's not exactly rare for DNA to spread at a crime scene. He said it has happened two times before. Earlier in the day, jurors heard from a fingerprint expert. Allison Rees, a fingerprint specialist with the ATF, said she didn't find Wint's fingerprints on anything in the house, including the pizza box, a computer keyboard near where the laptop containing security footage was removed, and a water bottle in an upstairs bedroom where some of the victims were found. Forensic evidence is playing a key role as the third week of the Daron Wint's murder trial wraps up. We're expecting 170 DNA slides to be entered into evidence today. We'll have updates later today. D.C. Detective Michael Pavero, with the ATF arson and explosives task force, whose main role at the crime scene was investigating the arson, took the stand Wednesday for the second time to describe how the ATF tested items taken from the home. Clothing taken from the victims -- including jeans from housekeeper Vera Figueroa and white pants from Amy Savopoulos, which have been stored in airtight containers since the killings, still reek of gasoline three years later. Amy Michaud, a forensic chemist at ATF, testified the white pants worn by Amy Savopoulos had blood on them and there also appeared to be what she called a "footwear impression." Under questioning from public defender Judy Pipe, Michaud revealed that analysts compared the footprint to Wint's shoes and were not a match. Alison Rees, an ATF fingerprint specialist, described her efforts to pull fingerprints from the house. She found prints belonging to Savvas Savopoulos in the house, which makes sense as it was their home. But Rees said Wint's fingerprints were not found anywhere in the house. Fingerprint samples from one of Wint's younger brothers were also provided. Again, there was no match. There were other prints found in the home — but Rees said she was unable to identify them. Remember, there was a knife found in the house's basement propping open a window. Investigators have said Wint's DNA was found on that knife. But Rees said there were no fingerprints recovered from it. Steven Weitz testified that some of his DNA wound up on an pair of scissors inside the house that he hadn't swabbed or collected. Weitz said he was swabbing a doorway near the scissors and that it's not all that rare for DNA to spread at a crime scene. He said it's happened to him two times before. Megan shares a dramatic moment from the courtroom. But is the DNA really a slam dunk? Prosecutors have already told jurors Daron Wint's DNA was found on a knife found propping open a basement window at the Savopoulos house. But a forensic biologist at ATF testifying for the first time Thursday provided more details about how exactly the DNA matches Wint and also revealed that DNA samples from multiple investigators inadvertently wound up on evidence. Forensic biologist Emily Head said she was able to pull a partial DNA profile from the handle of the knife that matched Daron Wint. How sure is the science? There's only a 1 in 90 billion chance the DNA does not belong to Wint, she testified. (Note: There are only about 7.4 billion people on the planet). There was no DNA detected on the blade itself. There were also no fingerprints found on the knife. However, Wint's public defenders have also raised questions about how the forensic evidence was collected and later handled. Head testified earlier this week that she recalled seeing another window in the basement propped open with a screwdriver. The screwdriver was, apparently never swabbed or collected for evidence. It should also be noted that the knife, which investigators say yielded Wint's DNA, was photographed by crime scene investigators a day after the victims were found inside the burning D.C. mansion — but apparently not bagged and collected into evidence until May 20, was six days later. Under questioning from the defense, Head revealed that while testing two towels taken from one of the upstairs bathrooms, she inadvertently transferred her DNA to them. She told jurors that talking, sneezing, sweating, coughing could all inadvertently transfer DNA that winds up in testing. And in this case alone, DNA from three different investigators — two ATF analysts and a D.C. police officer — somehow wound up on evidence taken from the home. Two days after the bodies of three members of the Savopoulos family and their housekeeper were found in their burning D.C. mansion and the family's blue Porsche was found ablaze in Lanham, Maryland, Daron Wint's van was found elsewhere in Prince George's County — also engulfed in flames. "Front to back it was burning," testified Vincent Pickel, a D.C. firefighter who served as the volunteer fire chief for Bladensburg, He told jurors he found the van ablaze in a parking lot near 51st Avenue and Frolich Lane in the Cheverly/Hyattsville area shortly after midnight May 16, 2015. It wasn't until May 20, when investigators had identified Wint as a suspect in the Savopoulos killings (based on the DNA match from the pizza crust), that they learned from Wint's family that the murder suspect drove an old blue minivan — and a lookout for the vehicle was sent out. The timeline of when the burning minivan aligns with a key piece of testimony from Wint's stepmother presented earlier this week. Wint's stepmother testified Wint was gone between May 13 and May 14 — which was unusual and caused concern among the Wint family about his whereabouts. He returned home to Lanham on the evening of May 14 with his blue van. But by early on the morning of May 16, his dad and stepmom noticed his van had gone missing, she testified. Even so, Wint appeared unconcerned about the missing van and told his dad and stepmom he wasn't going to report it to police, she told jurors. When it was recovered from the impound lot, the van was severely burned. The firefighter who responded to the burning vehicle — before authorities knew it was connected to a murder suspect — said fire crews had to use 600 gallons of tank water and eventually had to hook up to a fire hydrant to fully extinguish the flames. About the location where Wint's burning van was found: Apparently, it's an area of Prince George's County known to authorities as a place where people abandon their cars and set them on fire. It's also, according to prosecutors, near a metalworking plant where Wint worked several years before the killings. Recap: More missing and untested evidence? The DNA biologist who led the team testing evidence in the home where three members of the Savopoulos family and their housekeeper were killed testified there's no question Daron Wint touched or ate a piece of pizza found in the house after it was set on fire. But Wint's defense team showed Bureau of Alcohol, Tobacco and Firearms biologist Emily Head photos of evidence she never got to test — even though she requested they be collected by D.C. police. Jurors have already heard about a screwdriver found propping open a basement window that Head saw and asked be collected and sent to her lab. It never was. She testified this week she doesn't know why a sharp letter on the foyer floor of the Savopoulous house didn't make it to her lab. And perhaps most puzzling — Head said she was told by the medical examiner that some of the victims may have been bound with neckties, so she asked that swabs be taken of an open tie drawer in the house. But those swabs never made it to her lab for testing, she testified. The younger brother of the Maryland man charged with torturing and killing three members of a D.C. family and their housekeeper in May 2015 testified for the prosecution Monday, seeking to rebut the claim from his brother's defense lawyers that he planned and carried out the killings. Steffon Wint is the younger brother of 37-year-old Daron Wint, who's charged with killing D.C. businessman Savvas Savopoulos; his wife, Amy; their 10-year-old son, Philip; and the family's housekeeper Vera Figueroa. Daron Wint's team of public defenders has claimed it was actually Steffon Wint and another younger half-brother, Darrell Wint, who carried out the killings. Neither of the two younger Wint brothers has ever been publicly named a suspect, neither has ever been charged in connection with the killings and prosecutors dismiss the defense's theory of the case. Steffon Wint, who worked as a supervisor for a construction company, testified he was overseeing a paint job at a George Washington University dormitory building and other job sites on May 13 and May 14, 2015 — when the Savopoulos family was held captive in their Woodley Park mansion, extorted for $40,000 and then killed before the house was set on fire. A handwritten company time sheet showed Steffon Wint working from 6 a.m. until 4:30 p.m. on May 13 and between 6 a.m. until midnight — a total of 17 hours — on May 14. Steffon Wint testified a particular job that night ran late and he was required to stay until it was finished. Steffon Wint flatly denied any involvement in the crimes and told jurors he had only learned in the past month, in part through news reports, that his brother's lawyers would try to tie him to the crime. The questioning at times turned testy as Daron Wint's defense lawyer tried to poke holes in Steffon Wint's alibi and tried to assert his role in the killings. Public defender Judy Pipe, who questioned Steffon Wint, emphasized that the time sheets were handwritten and not signed off on by his higher-ups at the construction company. As a supervisor, Steffon Wint also acknowledged it was customary for him to travel throughout the day to various job sites, although he testified that he believed his bosses could track his whereabouts using GPS devices on the white construction-company pickup truck he drove for work. During one exchange, the defense lawyer claimed Steffon Wint borrowed Daron Wint's blue minivan during May 13 and May 14 when the Savopoulos family was held captive and killed. “Why would I borrow a van if I have a pickup truck?” Steffon Wint shot back. “Because you didn't want it traced back to you,” Pipe said. Steffon Wint told jurors he has another car besides his work truck and was not even aware his brother owned a van because he brother didn't have a license. Pipe also suggested Steffon Wint was responsible for setting his brother's van on fire in a secluded industrial parking lot in Prince George's County a few days after the killings, noting that a white pickup truck was seen leaving the scene of the burning van. Seeking to poke holes in his testimony, the defense also pulled phone call records between the two younger Wint brothers -- Steffon and Darrell. Steffon Wint had told the jury earlier he was not particularly close to Darrell, but the call logs showed nearly two dozen calls between the brothers between May 12 and May 15, 2015. Several of the calls were very short in duration, many lasting no more than about 30 seconds. Some of the calls were as short as 2 seconds long. The call logs only show the duration of the call, not whether the phone was actually picked up. An FBI agent who analyzes cellphone records, told jurors that the duration of calls in cellphone records, usually includes the time that the phone is ringing and that it typically takes about 30-40 seconds before a phone goes to voicemail. Prosecutors, meanwhile, introduced evidence showing the relationship between Daron and Steffon Wint was strained before the killings — meaning it would have been unlikely Daron Wint would've loaned his younger brother his van during the time of the killings. Steffon Wint told jurors that earlier in the spring of 2015 he had had a falling out with his brother, Daron, who had been living with him. Steffon Wint testified he kicked his brother out of the house after an argument about doing the dishes and hadn't seen him or heard from him until he saw his brother's picture on the news in connection with the killings. (Under questioning from the defense, Steffon Wint did acknowledge trying to reach Daron to offer him work painting the GW dorms but he said he never heard back). Prosecutors played voice messages from Daron Wint around the time he was thrown out of his brother's house in which he cursed out his family and made threats. “This ain't over yet,” Daron Wint said in the message. DNA that matches Daron Wint — but also his brother? Earlier Monday, an expert on DNA evidence from the FBI testified that a hair found among bedding in the bloody bedroom where the bodies of some of the victims were found matched Daron Wint. (Another hair found in construction helmet was also a match). But — and this a big but — the kind of DNA tested is what's known as mitochondrial DNA, which is inherited from your mother and is not unique to you. Siblings with the same mother have the same mitochondrial DNA. The defense seized on that fact to point out to the jury that because the mitochondrial DNA matched Daron Wint and because Daron and Steffon Wint both have the same mother — the DNA also matched Steffon. Darrell Wint, whom the defense also accuses of being responsible for the killings, has a different mother and therefore is not a match for the two hairs found at the crime scene. Still, it should be noted that prosecutors say other forensic evidence ties Daron Wint, specifically. Forensic biologists testified Daron Wint's DNA (a different kind of DNA that is unique to him) was found on the crust of a cheese pizza that had been delivered to the house while the Savopoulos house while the family was being held captive and also on a knife found propping open a basement window. Cell tower data mystery: Why was one of the victim's phones near Dupont Circle? Also on Monday, Richard Fennern, an FBI special agent who specializes in cellular analysis, gave a presentation to the jury, pinpointing the location of the victims and other key players in the case – or at least their cellphones – between May 13 and May 15, 2015. There are number of interesting take-aways. First, using cell tower data (which pings a nearby tower when the phone is being used to send or receive calls or text messages), the whereabouts of Jordan Wallace, the Savopoulos assistant who dropped off the $40,000 in cash, are accounted for exactly as he testified. Second, the number for a phone that was known to be used by Darrell Wint (Daron Wint's younger half-brother, who has been accused by the defense of carrying out the killings) pinged near Rhode Island Avenue in Northeast D.C. on the early afternoon of May 13. However, for the rest of that day — the day the Savopoulos family was taken captive in their home — the phone used by Darrell Wint never connected to another cell tower in D.C. Instead, data shows it pinging off several towers in the Silver Spring/Takoma area until 11 p.m. that night. Finally, and perhaps most mystifying, cellphone tower data shows Savvas Savopoulos' phone pinging a tower near Dupont Circle at 11:54 a.m. on May 14, 2015. That's during the time prosecutors have said the Savopoulos family was being held captive in their home and just 1 and 1/ 2 hours before firefighters rushed to the burning Savopoulos home and the bodies of the victims were found inside. How did Savvas Savopoulos' phone get to Dupont Circle on May 14? We don't know. The FBI agent didn't get to complete his testimony Monday and will resume Tuesday. The brother-in-law of the Maryland man charged with killing four people inside a D.C. mansion in May 2015 testified Daron Wint called him the day after the killings and sought his help setting his van on fire. Derek “Godfrey” Ayling, 47, handed over to prosecutors Facebook call and chat logs detailing conversations he had with Wint around the time of the killings. During an 11:16 p.m. call on May 15, 2015 — one day after the bodies of three members of the Savopoulos family and their housekeeper were discovered inside their burning Woodley Park mansion — Ayling said Wint asked him for a favor. “What kind of favor do you want me to do for you at 11 o'clock at night. I'm trying to go to bed,” Ayling testified he told Wint. Wint said he needed help burning his blue Ford Windstar minivan. He said he had sideswiped another vehicle and he thought the police were looking for his van. He wanted Ayling to drive with him somewhere to set the van on fire, the brother-in-law testified. Wint's van was found engulfed in flames in an industrial parking lot in Prince George's County shortly after midnight on May 16. Fire investigators testified earlier the van was intentionally set on fire. Photos of the burned-out van presented to the jury Tuesday showed the flames completely gutted the interior down to the springs. Ayling's testimony came during the fourth week of Wint's first-degree murder trial in D.C. Superior Court. Prosecutors say Wint, 37, held the Savopoulous family captive, extorted $40 thousand from the businessman father, then killed the family and their housekeeper, set the house on fire, took the money and ran. The phone call about burning the van wasn't the only encounter Ayling had with Wint on the day after the killings. Earlier that evening, Ayling testified he saw Wint working out at the New Carrollton gym they both frequented. Wint pulled out a wad of cash — $1,200 in $100 bills. Ayling said Wint, who was not employed at that time, said he had won the lottery. However, prosecutors pulled lottery records (lottery commissions are required to keep records of prizes over $600) which showed Daron Wint never actually claimed any lottery winnings around that time. Wint's team of public defenders say it was actually Wint's two younger brothers who planned and carried out the elaborate crime. Steffon Wint, one of those brothers, testified Monday for the prosecution, rebutting the defense's claims that he had anything to do with the killings. Prosecutors have indicated they do not believe Steffon Wint was involved. One week after three members of a D.C. family and their housekeeper were killed and found inside their burning mansion in May 2015, Vanessa Hayles was watching the 11 o'clock news when an update on the killings flashed across her TV screen — and then a photo of her fiance, Daron Wint. “I jumped out of bed,” Hayles, now 32, said Tuesday, during her emotional testimony for the prosecution in Wint's murder trial in D.C. Superior Court. Wint is charged with killing D.C. businessman Savvas Savopoulos; his wife, Amy; their 10-year-old son, Philip; and the family's housekeeper Vera Figueroa after holding the victims captive and extorting $40,000 from the family. Hayles said Wint, who was visiting her house in New York City at the time, appeared shocked after his photo appeared on the news. He immediately jumped up to call his father, she said, and then left her house with his phone. When he came back, the couple decided to spend the night in a hotel; Wint was concerned about the police showing up at her house, she said. By that point, Wint had been staying with Hayles in New York for the past several days. He never mentioned the killings, she said, but he had taken her on shopping trips and out to dinner – always paying with $100 bills. Where was all that money coming from? Wint told her he won the lottery, Hayles testified. And while he was in New York, he plopped down more than $200 on additional lottery tickets, she said. One of those was also a winner, Wint claimed — $2,000. After the night in the hotel, Hayles told jurors she went with Wint to a taxi stand where he told her he was going to take a cab back to the Maryland-D. C. area to turn himself into police. During her gripping, emotional testimony, Hayles spoke in a soft voice, often looking down and wiping tears away with a tissue. At times during her testimony, Wint was also seen dabbing at his eyes with tissues — the first apparent display of emotion from the defendant during the trial so far. Hayles told jurors she and Wint had been dating for about two years before they became engaged in May 2015. It was a long-distance relationship, because she lived in New York, so the two stayed in touch via Facebook. Hayles testified that she sent several Facebook messages to Wint on May 13, 2015 — during the time the Savopoulos family was held hostage in their home — but Wint didn't return any of the messages. Hayles testified she next heard from Wint sometime in the evening of May 14, when he called her. Later he messaged her a picture of two white iPhones and asked her if cellphones could be traced. Police have said two iPhones, belonging to Savvas and Amy Savopoulos were stolen from the family's home after the slayings. Wint also messaged Hayles a receipt from the office a Greenbelt, Maryland, immigration attorney showing he had paid the attorney $1,100 in cash. At the time of the killings, Wint, who was born in Guyana in South America, had an expired Green Card. In exchange for her testimony Tuesday, Hayles was given immunity by prosecutors, meaning it can't be used against her. She testified that after Wint was arrested, she handed over to police $1,500 in cash that he had left in her house after he visited her but that she she had used some of it to pay her rent. Hayles told jurors she is no longer in a romantic relationship with Wint. Several people who were with Daron Wint at the time he was taken into custody in May 2015 testified about the hours leading up to Wint's dramatic arrest by U.S. 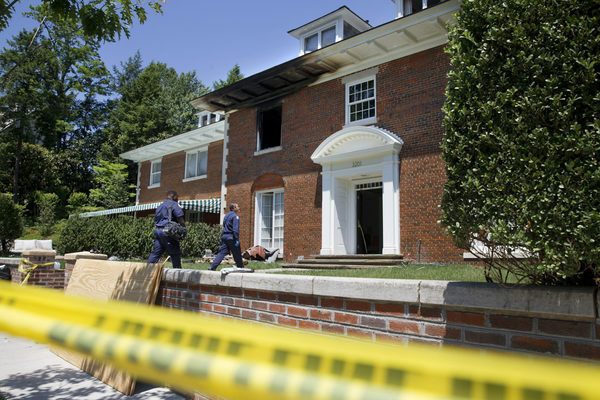 Marshals, one week after the bodies of three members of the Savopulous family and their housekeeper, Vera Figueroa, were found inside the family's burning D.C. mansion. Darrell Wint and a cousin were on the phone with a D.C. police detective, who was giving directions to the D.C. jail, right before U.S. Marshals swarmed the two vehicles the Wints and the young women were driving in. Wint is accused of holding the Savopoulos family and their housekeeper captive in their home for several hours, extorting $40,000 from the businessman father, then killing the victims and setting their house on fire. Wint has pleaded not guilty, and his felony murder trial is now in its fourth week in D.C. Superior Court. When Wint was arrested just past the D.C. line on May 21, 2015, police recovered a total of $23,000 in money orders from two vehicles — a white Chevy Cruze in which Wint was a passenger — and a box truck being driven by Wint's cousin, in which Darrell Wint was a passenger. Inside the box truck, police also found a wad of cash totaling about $7,300. In addition, police also found a crumpled piece of paper from a legal pad; written on the paper in black marker was the word “Jail” underlined three times, followed by the words “300 Indiana Ave NW,” and the phone number for D.C. Detective Jeff Owens, the lead detective on the investigation into the Savopoulos killings. George Elias, one of Wint's second cousins, testified Wednesday; he convinced Darrell Wint to turn his brother into police after Daron Wint's photo appeared on the news in connection with the killings. Darrell Wint “asked me to help him get out from what he was under,” Elias testified, but he had an ultimatum: “If he wants me to help him, he has to turn his brother in,” Elias said. Elias, who works as a mechanic and drove a white box truck for work, told jurors he agreed to drive with the brothers to turn Daron Wint into police — but that he wouldn't allow Daron Wint, who was picked up at a hotel in College Park, Maryland, to ride in his truck. So, Daron Wint rode in the Chevy Cruze, with three young women — two of whom had earlier helped Darrell Wint purchase several money orders. Chelsea Nunez, 25, told jurors she had met up with Darrell Wint earlier that evening, and he had asked her if she had heard of something called “the mansion slayings.” She said she hadn't. He then gave her cash and asked her if she could help buy several money orders to get a lawyer for a friend who was turning himself into police. He reassured Nunez she wouldn't get into trouble because he said he had spoken with a U.S. Marshal. Overall, Darrell Wint's contacts with his brother the day of the arrest and how he came to posses what was ostensibly part of the $40,000 in ransom money are still largely unexplained. Daron Wint's defense attorneys seized on the money order purchases, which he orchestrated, in an attempt to pin Darrell Wint to the killings. The defense has argued it was actually Darrell Wint and another younger brother, Steffon Wint, who planned and carried out the killings and that Daron Wint was manipulated by his brothers into turning himself in. Prosecutors have dismissed the defense's theory of the case, and neither of the two younger brothers has been charged. Steffon Wint testified earlier this week, denying any involvement in the crimes. It's unclear if Darrell Wint will testify in the trial. The prosecution took pains to show Darrell Wint was cooperating with police the night of his brother's arrest. Elias, the cousin, testified that Darrell Wint was on the phone with the police detective during the drive from College Park. Call logs presented to the jury show a series of phone calls between one of Elias' phones and the phone number belonging to the D.C. detective that evening, each lasting a few minutes. During one call, the detective was giving him directions to the jail, Elias testified. Meanwhile, in the Chevy Cruze, which was following the box truck the night Daron Wint was arrested, one of the women who was in the car with him testified he was rude and aggressive. During the drive from the College Park hotel on the night he was arrested, Wint kept asking: “How long?” and “Where are we going?” Ruffin said. Ruffin also said his hair — shoulder-length dreadlocks — smelled like smoke or coal or even gasoline. But Daron Wint's defense attorneys challenged her description of the scent, noting Daron Wint's arrest came seven days after the fire at the Savopoulos mansion. Ruffin never mentioned the scent when she was first questioned by police, and when she testified before the grand jury a few weeks later, she specifically said it didn't smell like gasoline, noted Jeffrey Stein, who is one of Daron Wint's public defenders. Ruffin, who was defensive and combative in her testimony, especially when pressed by the defense, told jurors she didn't remember to tell police everything that night in part because the arrest was traumatic. U.S. Marshals in unmarked cars rammed the women's car, boxed it in and surrounded them with guns drawn.